- Publisher This newly designed series of sermon outlines provides a treasure chest of stimulating ideas for a dynamic preaching or teaching ministry. - Publisher "Preach the Word" was the admonition that Paul gave to the young preacher, Timothy, almost two thousand years ago. 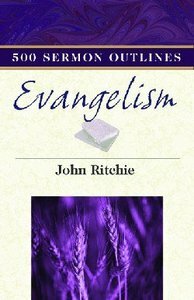 What was so essential then is still necessary today.For more than six generations, the John Ritchie Sermon Outline Series has illuminated Scripture, and it continues to bring out truths that change lives and minister to people today. These aids are not intended to diminish a personal, prayerful study of the Bible. Rather, they will encourage study by offering inspiring insights to those who preach and teach God's truths.The busy preacher or layperson will find helpful and stimulating ideas for a dynamic preaching and teaching ministry in these sermon outlines.John Ritchie (18531930) was a Bible teacher in Scotland, Wales, and England. His dynamic preaching was characterized by simple diction, scriptural integrity, timely illustrations, and flashes of humor. Ritchie authored more than two hundred books, among them Feasts of Jehovah, From Egypt to Canaan, and Tabernacle in the Wilderness. About "500 Sermon Outlines on Evangelism"
This newly designed series of sermon outlines provides a treasure chest of stimulating ideas for a dynamic preaching or teaching ministry. "Preach the Word" was the admonition that Paul gave to the young preacher, Timothy, almost two thousand years ago. What was so essential then is still necessary today.For more than six generations, the John Ritchie Sermon Outline Series has illuminated Scripture, and it continues to bring out truths that change lives and minister to people today. These aids are not intended to diminish a personal, prayerful study of the Bible. Rather, they will encourage study by offering inspiring insights to those who preach and teach God's truths.The busy preacher or layperson will find helpful and stimulating ideas for a dynamic preaching and teaching ministry in these sermon outlines.John Ritchie (18531930) was a Bible teacher in Scotland, Wales, and England. His dynamic preaching was characterized by simple diction, scriptural integrity, timely illustrations, and flashes of humor. Ritchie authored more than two hundred books, among them Feasts of Jehovah, From Egypt to Canaan, and Tabernacle in the Wilderness.